Two friends are standing on top of the Blue Mountains. 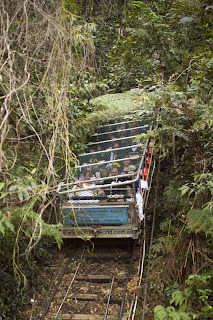 After signing up for a Sydney day tour, visiting the wildlife park at Featherdale and navigating the mountain terrain beneath the wondrous Three Sisters, their journey has brought them here … to the Scenic railway – the steepest railway in the world. "I don't know about this," one friend says, watching people in the carriage before them plummet into the dense forest below. "What are you afraid of?" his friend asks. "The angle, the tracks, the carriage, the chance that maybe …"
"Don't worry," his friend says. "They just sank $30 million into this. They renovated the tracks, carriages, control system, winch, even the platform we're standing on!" The nervous friend is relieved. He's comforted by the fact that Scenic World – the designer of the railway – is committed to pairing excitement with safety. The renovation gives him the confidence he needs to experience the ride of a lifetime. When Autumn 2013 rolls around, the renovation of Scenic World's railway will be completed. Although the renovation wasn't initiated for safety reasons, cautious tourists and seasoned explorers alike will flock to the new railway upon completion to experience a new thrill. According to Scenic World, "after making over 400,000 journeys, the carriages are due for an upgrade & we’ve made some design improvements that will make the experience even better!" Scenic World also recognizes the fact that machine life is finite and it's better to repair something when it's working than wait for it to malfunction. In addition to replacing and refurbishing vital components of the railway, Scenic World is also using funds to pay homage to the Mountain Devils. They say people will just have to wait to see what this entails, but assure the history behind the train and its surrounding environment will be more vivid than ever before. If you're visiting Australia or a native who has yet to explore the Blue Mountains, various Sydney day tours offer a unique opportunity to do experience the Blue Mountains in all their glory. Also, if you sign up for a Sydney day tour with Anderson's Tours, you'll have the opportunity to ride the new railway starting Autumn 2013. For 17 years, Andersons has included the railway in every one of its adventures.